HAVE YOU "LIKED" ROTTEN COMICS ON FACEBOOK? What are you waiting for?! Go right HERE! 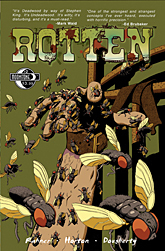 Rotten is creator-owned and independent, so we need your help spreading the filth! Agents Wade and Flynn have been on a little hiatus, but they'll return. They've got a mission to finish. The more fan support they get, the sooner they'll be back in the saddle. We thank you for your dirty Rotten support. 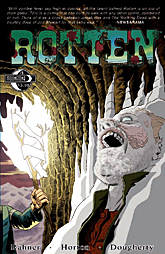 Rahner will be at the EMERALD CITY COMICON March 1-3. 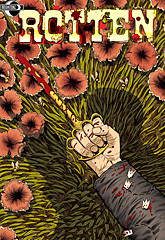 Dynamite booth (1802) signings: 3-4 p.m. Saturday and 1-3 p.m. Sunday. 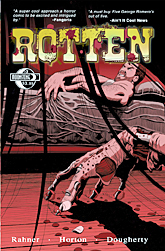 Dynamite panel: 6:10 Saturday, Hall B.
FANGORIA MAGAZINE rediscovers ROTTEN, interviews Rahner about it and his equally objectionable Dynamite work. Take it all in HERE. 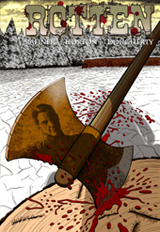 JUST RELEASED: ROTTEN: THE LOST DIARY OF JOHN J. FLYNN, U.S. AGENT! Order it from Moonstone Books, from Amazon or from your local comic shop. 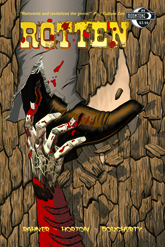 OUT FINALLY: ROTTEN VOL. 2: REVIVAL OF THE FITTEST! INCLUDING THE NEVER-SEEN ISSUES 10 AND 11! AVAILABLE NOW: ROTTEN VOL. 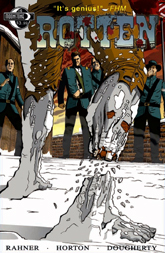 1: REACTIVATED - COLLECTING THE FIRST SIX ISSUES. 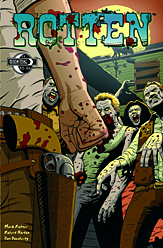 ORDER THE ROTTEN TRADE PAPERBACK HERE! DOWNLOAD ON iPHONE iPAD AND ONLINE HERE! WHET YOUR ROTTEN APPETITE ON THIS!